Both of the above uses of the term ‘melodrama,’ either as an adjective or a noun, convey somewhat negative connotations. This raises the thorny question: Why has melodrama been long castigated by critics, scholars, the intelligentsia and some audiences? In the West, too, melodrama (in drama, literature and cinema) has always been subject to often uncalled – for derision. Does this negatively charged term have to do with melodrama’s association with exaggeration, e.g., contrived and excessive emotion and performance? Is there a tendency to regard whatever is ‘popular’ with suspicion: the suspicion that it is ‘cheesy’ or ‘superficial’? Has our judgement been tainted by elitist-modernist thinking that is generally disdainful of all popular cultural forms? Is Malaysian film melodrama such as ‘Ombak Rindu’ just as crass, crude and bland as any of the junk that comes out of Malaysian TV these days? It may be that in Malaysia, melodrama, in layman’s terms, tends to be understood in terms of its heightened and excessive emotionalism as well as its focus upon family and moral values. Some may think of melodrama as replete with femininity and romance, as ‘chick flicks’ mainly appealing to women or girls only. Within the theoretical discourse of academic film studies, melodrama initially comprised a wide range of films from romance to Westerns. There have been attempts by Anglo-American film scholars to confine the scope of melodrama by referring only to films that highlight and centralise women, their problems and emotions; hence the term ‘women’s films.’ However, the term ‘women’s film’ may extend to other genres and films, ranging from the feminist-themed horror ‘Pontianak Harum Sundal Malam’ (‘Pontianak of the Tuber Roses’, 2004, Shuhaimi Baba) to startlingly awful romantic comedy ‘Andartu Terlampau … 21 Hari Mencari Suami’ (‘The Sassy Spinster … 21 Days Looking for a Husband’, 2010, Din C.J.). At the popular and journalistic level of English-language writing, this type of melodrama has often been referred to as ‘tearjerkers,’ ‘weepies,’ ‘chick flicks,’ and ‘soaps,’ among others. 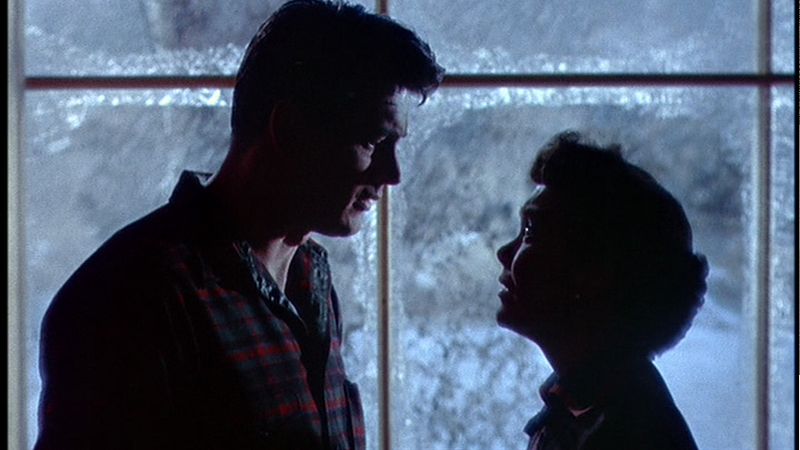 Thanks to academic film studies, which has helped assign value to old Hollywood melodramas such as Max Ophuls’ lush romantic tale of unrequited love ‘Letter from an Unknown Woman’ (1948) and Douglas Sirk’s visually striking ‘All That Heaven Allows’ (1955), ‘Written on the Wind’ (1956) and ‘Imitation of Life’ (1959), some of which were panned by critics during their theatrical release, some of the world’s contemporary directors have referenced old Hollywood melodrama to rework the genre ingeniously. For example, my favourite German director Rainer Werner Fassbinder who, inspired by Sirk’s melodrama, remade ‘All That Heaven Allows’ adding an element of race (as evident in ‘Ali: Fear Eats the Soul’, 1973). A raw and intense look at racial attitudes and social mores, ‘Ali’ explores a tempestuous love affair between a lonely 60-year-old German woman and a reticent Arab man half her age. Acclaimed Spanish director Pedro Almodovar, who in my opinion is a great storyteller, is well-known for utilising the codes of melodrama in most of his films. ‘All about My Mother’ (1999), ‘Talk to Her’ (2002) and ‘Volver’ (2006) are among his refreshing melodramas imbued with delightfully clever twists and turns. It is important to note that in different cultures, melodrama may possess distinct characteristics. For example, Asian melodrama’s tendency to accentuate the notion of suffering echoes most Asian cultures’ valorisation of human suffering. This is due in the main to, among others, the myriad religious cultures and beliefs in Asia which generally conceive of pain and suffering as one’s fate. Asian or Malaysian melodrama foregrounds suffering triggered not only by metaphysical fate such as tragedy, but also by socio-economic deprivation (such as poverty) and physical affliction (such as paralysis and blindness). These portrayals of suffering are intertwined with divisions along gender, class, race, and/or property lines. The dramatisation of suffering may engender a sense of pathos, overwhelming viewers with feelings of sadness and sympathy. In understanding melodrama as a mode or style, it is useful to consider another relevant notion, i.e., ‘sentimentalism,’ a tendency characterised by emotional excess (in the form of exaggerated grief) or an inclination toward shedding tears. In the context of Malaysian cinema, melodrama has been a predominant mode since its golden era in the 1950s/60s for its array of genres from comedy to horror. As noted by film historians, the early melodramatic form can be found in the theatrical bangsawan, in the oral literary tradition and Indian melodramatic films on which many early Malay films were based. The bangsawan itself was modelled on Indian Parsee theatre in which the plays performed reflected the hybrid influences of their creation: Arabo-Persian romantic melodrama, stories from the Indian epics (‘Ramayana’ and ‘Mahabharata’), and adaptations of Shakespearean and Victorian melodrama, among others. 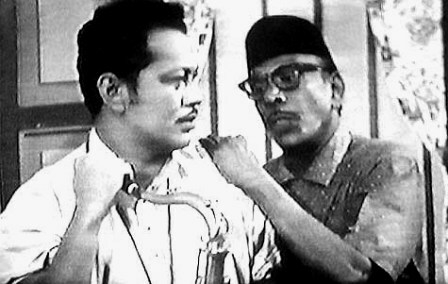 Many old Malay films, including those of P. Ramlee, were constituted by melodramatic mode and form, some inspired by the bangsawan and oral literary tradition while others resembled traditional Indian melodramatic plots. Therefore, it should come as no surprise that melodrama still attracts contemporary Malaysian audiences. One salient feature that distinguishes Malay melodrama from American melodrama can be discerned in its playing out of forbidden longings and renunciations, often depicted in the form of conflict between individual desires and collectivist aspirations. Such conflict – one of Malay melodrama’s underlying themes – attests to the melodrama’s depiction of the tension between tradition and modernity where the collectivist social value system must take precedence over individualism. One’s Malay self is invariably seen as being representative of the whole of his/her social system. What is perceived, judged and valued by other members of society may to a certain extent dictate and shape one’s moral conduct or standard of behaviour. If one views many old Malay melodramas from the golden era to the 1980s, one will easily discern that the potboiler ‘Ombak Rindu’ registers many similarities with the earlier films in terms of plot and structure. The story focuses upon a naive kampong ustazah (religious teacher) Izzah, who is sold to a brothel in KL by an unscrupulous uncle desperate for money. There, she meets her first customer Haris, who is a bourgeois philanderer. To escape from this nest of sin, Izzah begs Haris to marry her. He agrees to their surreptitious marriage. Haris, who initially treats Izzah as a mere sexual object, gradually becomes head-over-heels in love with her. Complications ensue when Haris learns that his family has arranged for him to marry his childhood girlfriend, who has recently returned from studying abroad. Due to the machinations of Haris’s domineering mother, Haris and Izzah’s relationship teeters on the brink of disaster. I would consider ‘Ombak Rindu’ a Malay melodrama par excellence (if you get what I mean). It truly exemplifies and complies with traditional conventions of melodrama in every single aspect, from mode, form, structure to ideology: the construction of the protagonist as ‘victim-hero/heroine;’ the excessive evocation of pathos and sentimentality; the highlighting of women’s self-sacrifice; and, moral polarisation. As well, its melodramatic narrative is variously structured around clichéd coincidences, sudden changes or reversals of fate; and, deus ex machina (last minute rescues), among others. Perhaps in an effort to adhere steadfastly to the formulaic ingredients of a melodrama, somewhat ruefully, some characters, e.g., Haris’s villainous mother, end up as hysterically ludicrous caricatures, reminding us of the characters in some cheap Indonesian sinetron (TV soaps). Stylistically, although the film’s beautiful panoramic view of landscapes and lavish decor and settings commendably serve as a feast for viewers’ eyes, there is lack of attempt to propel the film’s narrative and themes forward significantly. In this respect, what difference does ‘Ombak Rindu’ have to offer in terms of cinematography given that many Malaysian telemovies and soaps also feature beautiful views and scenery these days? It is a pity that the film dismisses the prospect of utilising its mise-en-scene as stark irony – as typically found in the cinematic tradition of melodrama – to contrast notions of the repressed and the unspeakable (for example, characters’ repressed/suppressed feelings in the form of romantic longing and yearning, sexual desire, lovesickness). This is due to director Osman’s mise-en-scene lack of deliberate luridness and stylisation in the Sirk-ian/Almodovar-ian sense. I personally feel that the cathartic scene towards the end of ‘Ombak Rindu’ has a particular poignancy and a touch of Jins Shamsudin (known for his 1970s/80s ‘Esok’ film melodrama series). In the final scene, Haris comes to see Izzah to ask her forgiveness and to admit his wrongdoing. Both characters, overcome by emotion, burst into tears. Although crying in general is somewhat contagious, I would argue that the ways in which particular scenes and actors’ performances are staged also contribute to the arousing of viewers’ emotions. Viewers could hardly fail to observe Haris’s sorrowful eyes, the tears trickling down his cheeks and the quiver in his voice as he delivers his plaintive, mournful lines. I believe that all this occurs – cognitively speaking – through the process of viewers’ identification with onscreen characters (such as Izzah and Haris). While performing ‘imagining’ activities via this identification, viewers both empathise and sympathise with the characters in line with their assessment of the characters’ ‘moral valence.’ The film’s theme song, which highlights the film’s more dramatic moments, elevating specific scenes to their emotional pinnacle, seems to have marred the grace of the film due to its too frequent deployment, resulting in a certain soppiness ad nauseam – albeit it may have lulled viewers into the film’s utopian-escapist world. Certainly it would be unfair for one to solely find fault with – even ridicule – melodrama. But, a melodrama like ‘Ombak Rindu’ – rather than ushering in anything courageous and inventive – opts itself to be complaisant and unsophisticated, a decision that would have had the judges of this year’s Malaysian Film Festival nodding their heads in approval. Alas, the film features a run-of-the-mill female protagonist, Izzah, a tear-inducing, masochistic and passive heroine, who must bear one misfortune after another. But, an against-the-grain reading of the film may place her in a different light altogether. As I personally do not believe in happy endings, I wish she had chosen the course of ‘independence’ as a way of articulating her own subjectivity, a form of subjectivity that entails transformation or transcendence of the state of moving from conformity to self-reliance. 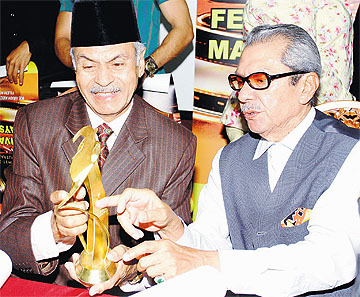 But, that will not affirm ‘Ombak Rindu’s distinct ethos as a ‘Malay’ melodrama, an ethos that not only is socially sanctioned within the film’s fictional world, but also seems to be endorsed by our Kakcik and Makcik, who have been enticed into the cinema by the belief that love conquers all. Norman is currently researching and writing about Malaysian cinema. In his spare time, he enjoys watching silent movies and listening to Indian ghazals.